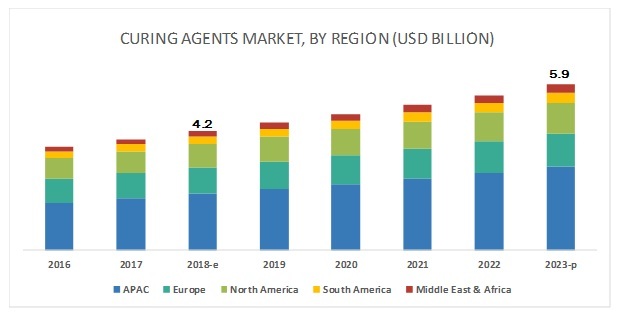 [138 Pages Report] The market for curing agents is projected to grow from USD 4.2 billion in 2018 to USD 5.9 billion by 2023, at a compound annual growth rate (CAGR) of 6.80% during the forecast period. The growth of applications such as coatings, wind energy, electrical & electronics, construction, composites, and adhesives is majorly driving the curing agents market. The epoxy segment is estimated to account for the largest share of the curing agents market during the forecast period. Epoxy resins are used for manufacturing coatings, adhesives, composites, and other products. They act as additives that are used to cure or harden various materials in different surroundings. The increase in the use of epoxy curing agents in applications such as coatings, wind energy, electrical & electronics, construction, composites, adhesives, and others is expected to boost its demand. The rising need for high performance, durable, and easy-to-use products is the key factor contributing to the growth of the epoxy-based curing agents market. Coatings is estimated to be the largest application of curing agents during the forecast period. Curing agents are used in marine, can & coil, decorative, protective, and general industrial coatings. Curing agents are used in primers to enhance the adhesion quality of coated parts in marine and other applications, especially on metal surfaces where corrosion and chemical resistance are important to protect them from damage or wear. Drivers for the growth of the coatings sector are growing economy, growth in the end-use industrial activity, and an increase in its demand in the APAC region, especially from emerging economies such as China, India, Thailand, Indonesia, and Malaysia. For instance, in March 2017, Huntsman Corporation launched a new portfolio of low-temperature curing agents for heavy-duty industrial coating applications in sectors including oil & gas, marine, transportation, and industrial maintenance. Such developments are expected to propel the demand for curing agents in the coatings application. The curing agents market in APAC to register the highest CAGR during the forecast period. APAC is the most promising end-use market and is expected to remain the same in the near future. The continuous rise in the manufacturing of products for use within the region and for exports drives the demand for curing agents. Rising population and growing end-use industries have led to innovation and developments in the end-use industries, making it a strong application industry hub globally. 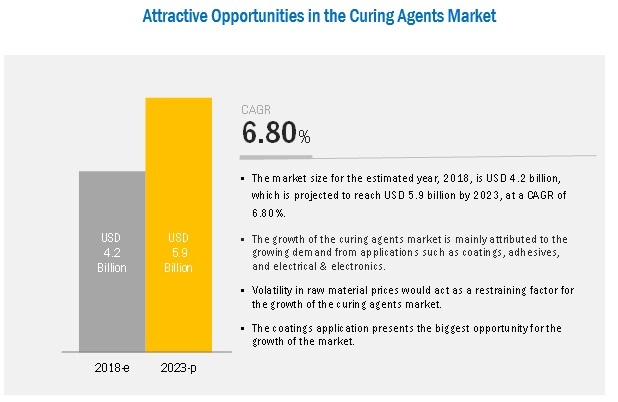 The major players operating in the curing agents market are Evonik Industries (Germany), Hexion Inc. (US), Huntsman Corporation (US), Cardolite Corporation (US), and BASF (Germany). Founded in 2007 and headquartered in Essen (Germany), Evonik Industries is a leading global chemical manufacturer and service provider with a technologically advanced product portfolio serving its customers. The company is specialized in high-performance curing agents, catering to a variety of industries across the globe. The company is highly focused on the European market for sales of its products. However, it has ample opportunities in the emerging markets of APAC and the Middle East & Africa for the purpose of investments & expansions, as these high-growth markets offer lucrative growth opportunities. In January 2017, Evonik Industries acquired the specialty additive division of Air Products and Chemicals (US) for USD 3.8 billion. This acquisition helped Evonik increase its share in the global curing agents market. In December 2017, Cardolite introduced a new waterborne, emulsion-type curing agent for epoxy coatings, NX-8401. The product is completely free of solvent, has low viscosity, and is easily reducible with water. In March 2017, Huntsman Corporation, launched a new portfolio of low-temperature curing agents, Ara, for heavy-duty industrial coating applications in sectors including oil & gas, marine, transportation, and industrial maintenance. What are the upcoming applications of curing agents? What are the key trends in the applications of curing agents? What are the trends in the technologies of curing agents? The study involved four major activities in estimating the current market size for curing agents. The exhaustive secondary research was done to collect information on the market, peer market, and parent market. The next step was to validate these findings, assumptions, and market size with industry experts across the value chain through primary research. Both top-down and bottom-up approaches were employed to estimate the complete market size. Thereafter, the market breakdown and data triangulation procedures were used to estimate the size of the segments and subsegments of the overall market. In the secondary research process, various secondary sources such as Hoovers, Bloomberg BusinessWeek, and Dun & Bradstreet were referred to, so as to identify and collect information for this study. These secondary sources also included annual reports, press releases & investor presentations of companies; white papers; certified publications; articles by recognized authors; gold standard & silver standard websites; food safety organizations; regulatory bodies; trade directories; and databases. After arriving at the overall market size-using the market size estimation processes as explained above—the market was split into several segments and subsegments. In order to complete the overall market engineering process and arrive at the exact statistics of each market segment and subsegment, the data triangulation and market breakdown procedures were employed, wherever applicable. The data was triangulated by studying various factors and trends from both the demand and supply sides. This research report categorizes the curing agents market based on types, applications, and region.